We have two worship services on Sundays: a morning service at 10:30 a.m. and an evening service at 5:00 p.m. True and genuine worship is not coming to a certain place on a specific day of the week; it’s not going through certain rituals or liturgy. True and genuine worship is coming into the presence of God, the Creator and King. We come not as strangers and enemies, but as sons and daughters. Our worship celebrates the grace and mercy of God through prayer, singing, Scripture reading, and hearing God’s Word preached. Worshipers dress in various ways, and we hope and are sure that you will feel welcome no matter how you dress. We are located in northeast Delray Beach at 2703 N. Seacrest Blvd Delray Beach, FL 33444 – on the southeast corner of Seacrest Blvd and Gulfstream Blvd. 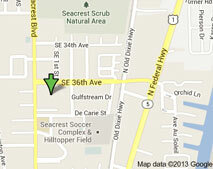 Get directions to Seacrest. Once you have parked, the entrance to the Sanctuary is in the southwest corner of the property. There are greeters inside the church narthex (lobby), and ushers who will provide you with a bulletin and help you find a seat in the sanctuary. Our bathrooms are located in the Administration Building, just down the walkway from the Sanctuary. Any of our ushers will be happy to point you in the right direction. For infants and very young children, we have a lovingly nursery just across a small parking lot from the Sanctuary. Kids age 2 through 3rd grade are dismissed for Sunday School about halfway through the morning service. Read more about the Children’s Ministry here. I have attended worship. What else can I do to get to know Seacrest? If you have questions, please contact our Church Office. Attend a New Members’ Class. Learn more about New Members’ Classes here.